ATLANTA, GEORGIA - As the winter season draws near OUZO International FC is making big headlines both on and off the pitch. As OIFC completed its inaugural year, teams across the southeast United States were taken back this team ability to consume copious amounts of beer on the sideline before games, in a parking lot after the games, at Meehan’s Irish Pub after the parking lot. This all fell within the guidelines set forth by its parent club OUZO FC based out of Soccer City Indoor complex in Toronto, Canada. In the summer of ‘05 OUZO FC purchased a much depleted Phoenix FC side in which only 7 players remained for an 11 aside team. Former Phoenix winger and current OIFC President, Justin Milam took the reigns and much like its previous club’s name OUZO IFC was found raising from the ashes. Milam, along with the 6 other founding fathers worked hard in the off season to assemble a make shift OUZO side that would eventually finish 2nd in the Atlanta Silverbacks’ Summer 11v11 summer league. The league was utilized as a warm up for the club’s ultimate goal, the Atlanta District Amateur Soccer League (ADASL). It was here that OUZO learned that Muslims from Tunisia don’t drink. Although their passion for the game was strong along with their inability to get their heads up and pass, the board convened and created the “No Drink, No Play Policy”. A policy that has been strictly enforced to date. Back to where they started, Milam (a bar manger) asked every patron that consumed 10 or more drinks in one sitting if they would be interested in joining OUZO IFC. This proved to be a successful recruiting tactic to fill the remaining roster positions left void by the Tunisians. Throughout the grueling 7 month 23 game season, the beers flowed, as did OUZO’s lack of ability to score more then 2 goals per game which still garnered them 3rd place in the ADASL 3rd Division. With a staggering 0.68 goals/game there was little opposing teams could do crack what was the best defense out of 40 teams. On the backs of their defense OUZO IFC earned themselves a promotion to the second division for the ’06-07 season. 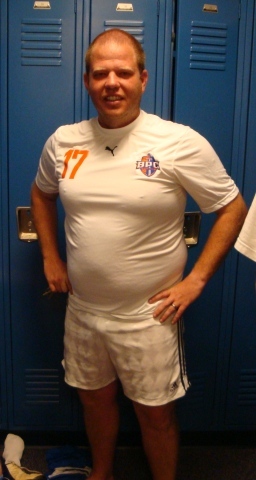 In the upcoming season, all the lads hope for is that, the beers flow and their bellies grow. O4LTM - if these three identification figures are signaled with your hand……you are truly OUZO 4 LIFE Biatches!!!!! !